For decades, beekeepers have used antibiotics in the control of certain honey bee diseases, particularly European foulbrood and Nosema disease. While antibiotics can be effective drugs, their misuse can lead to the development of strains of disease that are resistant to the medications. Resistance has occurred as well in diseases of humans and livestock. American foulbrood, AFB, a honey bee brood bacterial infection, is often resistant to antibiotics. The use of antibiotics is not effective for controlling AFB, as they only suppress the disease-causing bacterium; they don’t kill it. To limit the use of antibiotics administered to animals, the U.S. Food & Drug Administration has recently enacted a Veterinary Food Directive. This action will greatly restrict the use of antibiotics administered to bee hives. Unfortunately, the unavailability to obtain the antibiotic, Terramycin, will likely lead to the spread of European foulbrood, the fastest spreading honey bee brood disease. A report the Idaho Statesman, http://www.idahostatesman.com/news/nation-world/health-and-medicine/article172080432.html, describes research being conducted at the University of Idaho. Researchers are trying to determine the mechanisms of bacteria developing resistance to antibiotics. Such a resistance is a problem for treating disease anytime antibiotics are used in humans, livestock, and even in honey bee colonies. The results, published in Nature, focus on plasmids, tiny pieces of DNA that can be transferred between bacteria cells. Plasmids transfer traits, such as resistance to antibiotic drugs, from one bacterium to another. Surprisingly, this can occur in as little as a few minutes. Resistance to antibiotics also occurs when bacteria chromosomes mutate. Interestingly, plasmids can produce resistance to multiple antibiotics at once. Research team leader, Dr. Eva Top, describes how we are affecting bacteria: “They’re picking up a lot of antibiotic resistance genes and spreading them because of our habits of using so many antibiotics.” Today’s photo: migratory hives in Idaho’s Treasure Valley, an area of diverse agricultural crops. Many crops are in bloom, and honey bee colonies are collecting nectar and building up honey stores after travelling for pollination service. Queen bees and worker bees develop from fertilized eggs, and drone bees develop from nonfertilized eggs. 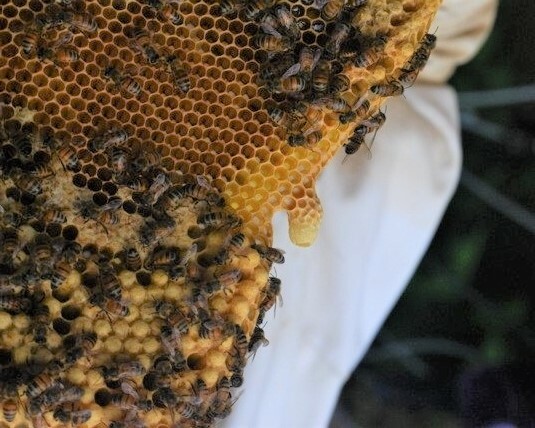 Queens develop from eggs laid in downward facing queen cell cups similar to the one on the side of a top bar hive comb (photo by Melissa Bridgman). A New York Times piece, https://www.nytimes.com/2017/08/31/science/honeybees-queens.html?, describes recently published research from PLOS Genetics identifying a newly-identified mechanism involved in the development of queen bees. It has long been known that queen bee development is associated with diet. Worker bees feed developing queen bees and worker bees a different diet even though they both develop from the same fertilized eggs. The larvae of both queens and workers are fed an enriched food, royal jelly, in the first day of larval development. Worker larvae are then fed secretions workers produce from “bee bread,” a food consisting of fermenting pollen and honey. Queen larvae, however, continue to receive royal jelly through their larval development and throughout their life. The new research finds that caste development, the differentiation of queens, which have a complete reproductive system, from workers, that are sterile, uses plant-based small molecules called microRNA. The study’s co-author, Dr. Chen-Yu Zhang explains, “The royal jelly and plant microRNA work together to affect caste formation.” It now appears that the plant-based molecules suppress the workers’ ovary development. This research expands our understanding of queen bee caste differentiation. It also reflects the interdependence of plants and honey bees. Flowering plants and bees have been co-evolving for the past 100 million years. Plants and bees share microRNA, a plant substance that affects bee development and a bee substance that is important in the development of certain flowers. Dr. Zhang explains that microRNA from bees can make flowers larger and more colorful. The authors relate that these microRNA molecules affect species in different kingdoms, such as plants and insects or plants and humans. Other experts reacting to the report expect that microRNA will emerge as a major area of research in human medicine. Varroa mites are the greatest pest killer of honey bees. If left unchecked, these parasites will kill a colony of bees in about 18 months. 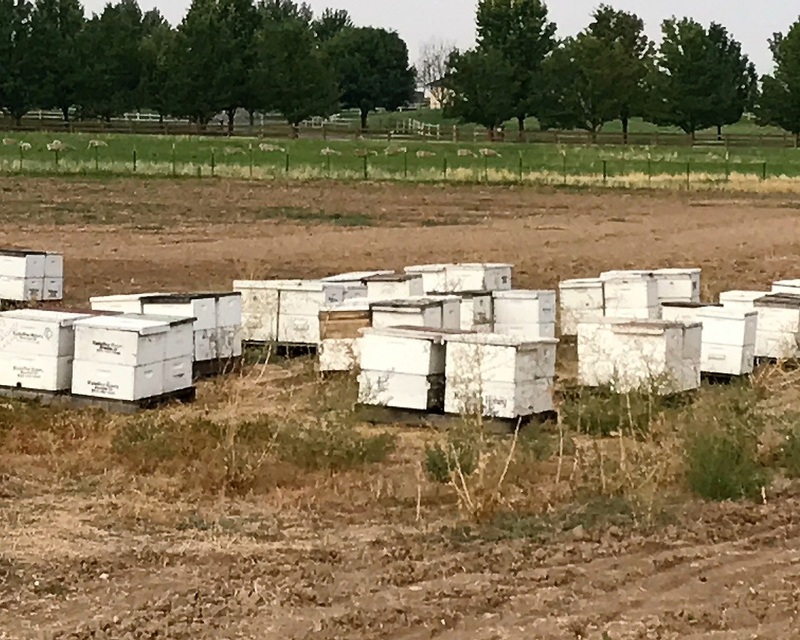 It is, therefore, necessary for beekeepers to be aware of the mite load that a hive carries and to take corrective action when mite numbers exceed critical levels. Varroa mites live in bee hives, and they reproduce in the sealed brood cells of the pupal stage of honey bee brood. Mite levels typically peak in late summer at the time that queen bees slow their rate of egg laying. Excessive numbers of Varroa mites in the hive often lead to colony death. Mites weaken individual bees by sucking the bee’s blood, known as hemolymph. When a mite pierces the exoskeleton of a honey bee, it passes numerous viruses to the bee. At least 15 Varroa-vectored viruses have been identified. Varroa mites and the viruses that they transmit lessen the life span of the bees, leading to smaller winter colony clusters. These smaller clusters are often unable to generate enough heat to survive the winter. Some individuals ignore the threat of parasitic mites and lose their bee. Others attempt to kill the mites with harsh chemical treatments. They are usually successful in reducing the colony mite loads, however, repeated use of harsh chemicals leads to populations of mites that are resistant to the chemicals. Beekeepers who take a judicious approach to controlling parasitic mites develop their own Integrated Pest Management program that involves mite sampling and treatments as necessary. The Honey Bee Health Coalition offers Tools for Varroa Management: A Guide to Effective Varroa Sampling & Control as a free document. The guide and video demonstrations of Varroa control techniques may be downloaded from http://honeybeehealthcoalition.org/varroa/. There are several methods of sampling a bee hive’s mite levels, including powdered sugar rolls and alcohol rolls. In today’s photo, Rita is counting the number of Varroa mites on 300 bees using a simple alcohol roll test.